Mrs Pranali Sawant has been wearing glasses since 14 yrs though she used contact lenses frequently and never had any issues with her eyes until recently. Her grandfather had passed away and she went for the cremation ceremony to Mangalore where her grandparents live. The day was too long and she was exhausted by the time she went home. The whole family had reached home with a heavy heart and had retired to their respective rooms for the night. Mrs Pranali took off her contact lenses and kept them in the solution. From the time she came to Mangalore she felt her eyes were dry and had gotten lubricant eye drops for herself. She wanted to use her lubricating eye drops before hitting the sack. She had kept the eye drops at the bedside so she went ahead and reached out and put them in her eye. After adding the drops to her eye; something strange had happened. Her eyes had burning sensation but she was too exhausted and thought its normal and went off to sleep. The next morning when she got up she was in a lot of pain. She had a flight to catch in 4 hours for Mumbai and was in a hurry. When she went to the washroom to freshen up she noticed her lower lid was swollen and had bloodshot eyes. The eye pain was excruciating but she took a painkiller and decided to show to an eye specialist first thing as she landed in Mumbai. While she was packing her luggage she realised that she didn’t add the eye drops but had added some other drops which looked similar to the bottle of eye drops. She panicked and without wasting any time she checked for the best eye hospital in Mumbai and came across AEHI. She got an appointment for herself at AEHI. She landed in Mumbai and rushed to AEHI. Mrs Pranali met Dr. Rajesh Mishra Glaucoma and Cataract Surgeon at AEHI who checked her eyes and mentioned had an adverse reaction to the wrong medicines that she added to her eye. 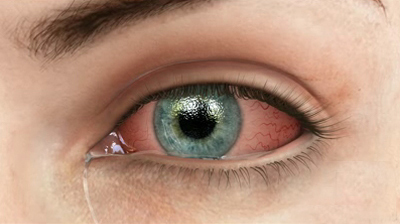 Mrs Pranali was prescribed few eye drops and medicine to help overcome the adverse reaction and pain. She was asked to come in for a follow-up 3 days later. 3 days later when Mrs Pranali came her eyes didn’t look so red and seemed to be on the track of healing well. A week later her eyes were back to being normal. Mrs Pranali is thankful that she got the treatment for her mistake in time and didn’t lead to any major disasters. One must always be careful of the eye drops that are adding. Check the expiry date before using any eye drop. Discard the eye drop one month after opening. Wash immediately with water and show a specialist. Dr. Rajesh Mishra (MBBS, MS, FAEH, and PGDHM) is Glaucoma and Cataract surgeon at Advanced Eye Hospital near Vashi, Navi Mumbai. He has years of experience and has served at various hospitals around the country. Being glaucoma specialist, his work is mainly focused on Glaucoma and Anterior segment. He has successfully treated a variety of glaucoma patients, children and adults, as well as operated more than ten thousand cataracts.